From blood tubing to heart valves, biocompatible plastics have become omnipresent in the medical device industry. There’s a reason recent years have seen significant advances in pacemakers, joint replacements and stents: The advanced properties of specialty plastics have made these innovations possible. 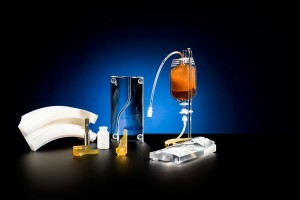 Why have specialty plastics brought about a golden age of medical devices? Namely, these biocompatible plastics offer strength, malleability and chemical inertness impossible with traditional metals. It’s also possible to manufacture these devices at lower cost than traditional metals, though plastic devices often last longer and perform better. In short, the golden age of biocompatible plastics has only just begun. We machine custom plastic parts for clients in a wide range of industries. In this blog, we’ll share some information about biocompatible plastics that pass testing procedures issued under ISO 10993 or the USP Class VI. What is biocompatibility? Biocompatible plastics enhance healing functions without causing toxic or allergic reactions. They’re able to do so because of their chemical inertness; they don’t interact with the environment of the human body, enabling the body to accept these devices without ill effect. Implant Devices: Includes stents, grafts, pins, plates, etc. Surface Devices: Includes many monitoring devices, endotracheal tubes, catheters, contact lenses, sigmoidoscopes, etc. Externally Communicating Devices: Includes pacemakers, oxygenators, blood administration devices, laparoscopes, etc. Based upon their categorization, materials must undergo testing of their chemical, thermal, mechanical and other properties. We machine the worlds most advanced plastics, with clientele spanning the globe. If you’re seeking to determine the advanced plastic right for your medical device, we encourage you to get in contact for a free quote. We can apply our knowledge to your specific application to find a suitable, cost-effective solution.